The Champions League returned to Manchester, with City playing hosts to Olympique Lyonnais. Pep Guardiola, banished to the stands for this match due to a sending off last season, opted for his usual 4-3-3 formation, while Bruno Genesio sent out the away side in a 4-2-3-1 shape with Memphis Depay leading the line ahead of Nabil Fekir. Manchester City were criticised for their slow start, although it was likely that this was a ploy to bait Lyon into pressing. Depay and Fekir would initially hover around Fernandinho, however it wasn’t too difficult for City to get the Brazilian free. 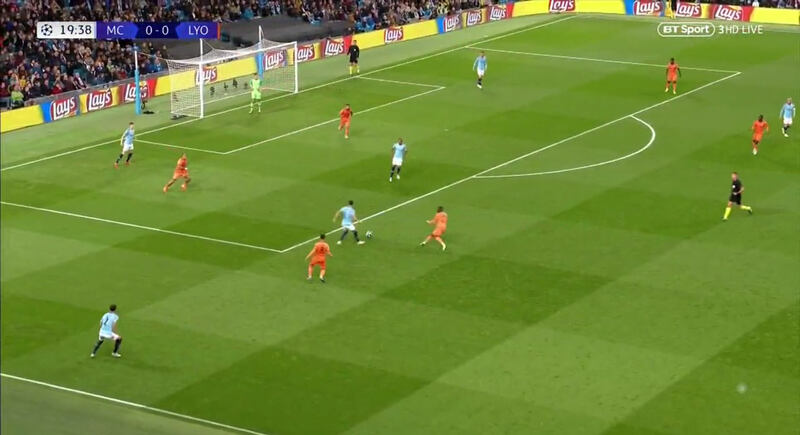 Depay rarely blocked the angle into Fernandinho and often stood ahead of him, meaning that if City could draw Fekir away, such as by having a centre-back dribbling out from the back, it was easy for the defenders to pass out. Despite often having the space to turn out and play forward, Fernandinho would simply hit it back to the centre-backs behind him. It’s possible that this was simply the Brazilian playing poorly but it seems more likely that it was an attempt to bait Fekir and Depay into pressing the backline, as they would often push up towards the centre-backs if it was played backwards to them. When Fekir or Depay went to close the centre-back down, Ilkay Gundogan would drop back alongside him, drawing Tanguy Ndombele up the pitch behind him, and look to receive a pass and bounce it into the feet of Fernandinho, who could play it forward into the space Ndombele had left. Depay is drawn into pressing but Fekir still keeps close to Fernandinho. Gundogan moves back, drawing Ndombele up the pitch. 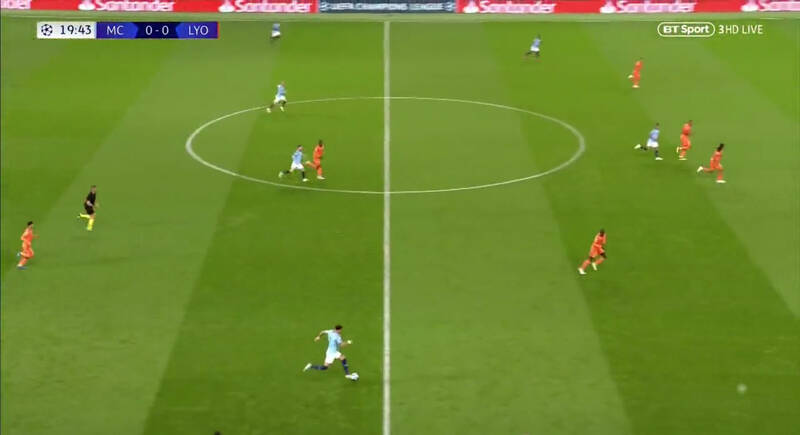 The main problem for City was that Depay and Fekir often wouldn’t rise to the bait, meaning they couldn’t draw Ndombele up the pitch and City were left to try and break down two banks of four – this only worsened after Lyon scored, as they were even less willing to press now they had the lead. 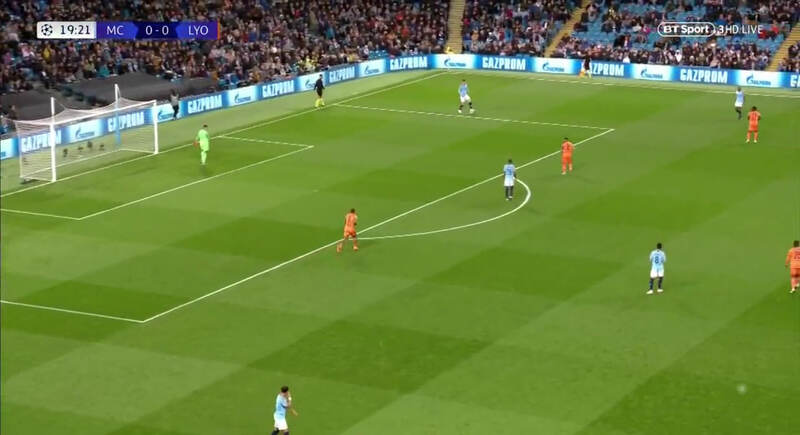 City’s line-up wasn’t well-suited to this: Bernardo Silva prefers to come inside rather than beat his full-back on the outside and Gundogan generally held back in the midfield rather than attacking the box, so if the ball went out to the right it would soon be played backwards again. Kyle Walker posed some threat when he attacked but these moments were few and far between. The left worked better, with David Silva and Raheem Sterling combining to produce City’s best moments of the first half, however they didn’t quite manage to score – perhaps because most of these chances fell to Sterling, who isn’t a particularly lethal finisher. Another big problem for City was that they kept giving the ball away sloppily. Fekir jumped on two loose balls by Fernandinho – first to set up Maxwel Cornet for the opener and then to get a goal of his own. Fernandinho is often said to be underrated for City and while he probably just had an off-day, this is the kind of game that suggests he’s probably rated about right: he provides the defensive ability missing from City’s other midfielders and is decent in possession, but, although adequate, he lacks the real ability to excel as the organising midfielder in possession as Sergio Busquets, Philipp Lahm or Xabi Alonso have previously for Guardiola – which makes it understandable why City tried to bring in Jorginho in the summer. Maybe it was the difficulty in switching between an initial slow tempo to a faster one when City wanted to break, or maybe it was just sloppiness, but neither really suggest Fernandinho is a natural playmaker. While City were poor on the ball, Lyon were excellent. They moved the ball quickly and confidently, evading City’s pressing with excellent technique and looking to break quickly, attacking the space behind City’s high line. Depay, Fekir, Cornet, Houssem Aouar and even Ferland Mendy would all spring forward, while the two holding midfielders and the remaining defenders maintained solidity at the back. 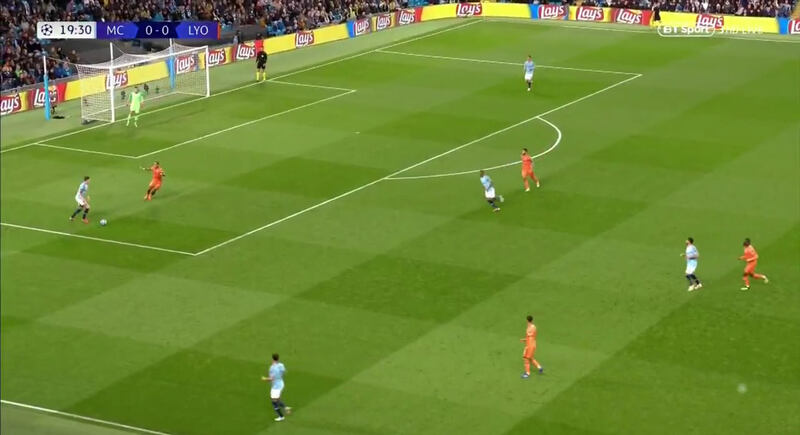 City were often able to stop these attacks with tactical fouls, but this got harder to do when their sloppiness in possession gifted the ball away closer to their own goal. City reorganised for the second half, changing to a 3-2 shape in the initial build-up – Kyle Walker moved deeper alongside his defenders, while Fabian Delph tucked in off the left alongside Fernandinho. 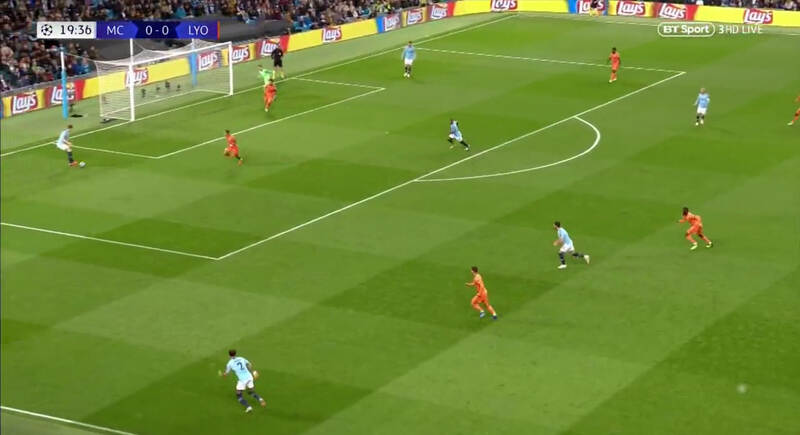 This made it easier for City to play out from the back, as Fernandinho was no longer outnumbered by Depay and Fekir, while also allowing City to maintain a better presence in attack, as Gundogan no longer had to drop back. 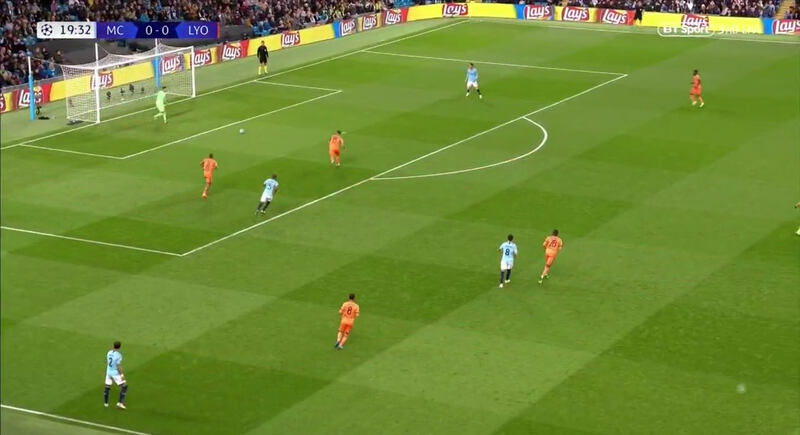 Gundogan was soon replaced by Leroy Sane, allowing several of City’s players to take up better suited positions: Sane on the left and Sterling on the right could attack down the outside and stretch Lyon’s defence, while the Silvas could play inside and roam around in the gaps. Sergio Aguero replaced Gabriel Jesus in attack, offering more of an all-round goal threat, and eventually Riyad Mahrez was brought on in place of Sterling, but these substitutions didn’t alter what was now a working system, as City completely dominated the second half. Bernardo Silva got a goal back after Sane dribbled past Pape Cheikh Diop and Rafael Da Silva, forcing Marcelo to come across and confront him, leaving the Portuguese in space to finish the pull-back. The speed of Lyon’s attackers still posed a threat on the counter but the second half was spent hanging on to their lead. As Lyon were left more and more stretched by the width of City’s attack, Fekir would drop back into the midfield to cover any gaps that arose, and this switch to a 4-5-1 was made permanent with the introduction of Lucas Tousart with ten minutes to go. The away side defended valiantly and managed to hold onto their lead, despite the considerable threat City now posed.